I am obsessed with this coconut rice. I’ve experienced its flavors in restaurants many times and have struggled to recreate them at home. When I learned how to make this rice in my cooking class, I knew it would be a staple in my kitchen from now until eternity. The rice cooks with ease and is delicately flavored with coconut, cinnamon, mustard seeds, ginger, and the delayed-onset heat of a chili. One taste, and you’ll crave this stuff too. To make it, preheat your oven to 400º F. Melt 1 tablespoon of coconut oil in a oven-proof pot over medium heat. 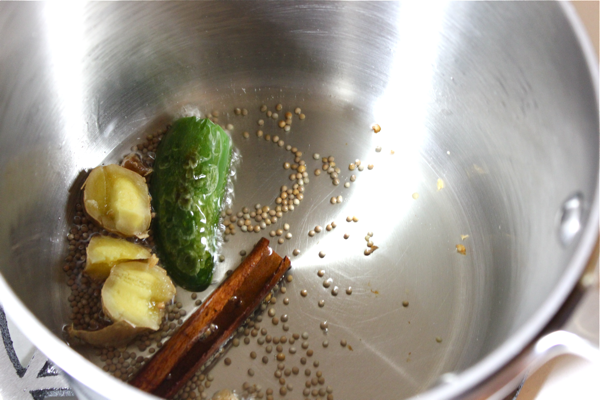 Drop in 1 teaspoon of mustard seeds, 1 cinnamon stick, a few slices of fresh ginger, and 1 halved chili. I used a jalapeno, but any chili will work. The oil should simmer very lightly to let the ingredients infuse without burning them. In a separate container, let 1/4 cup of jasmine rice per serving soak in water for a few minutes. 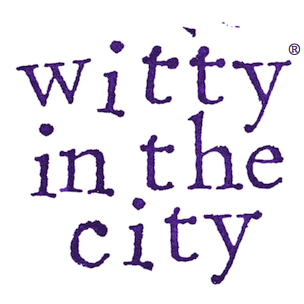 When your oil infusion is fragrant, drain your rice and add it into the pot. Stir the rice around to coat it in the oil. Then, for every 1/4 cup of rice you added, pour in 1/2 cup of lowfat coconut milk. Season the mixture with salt to taste. Stir the rice, cover the pot, and bake it for 17 minutes. 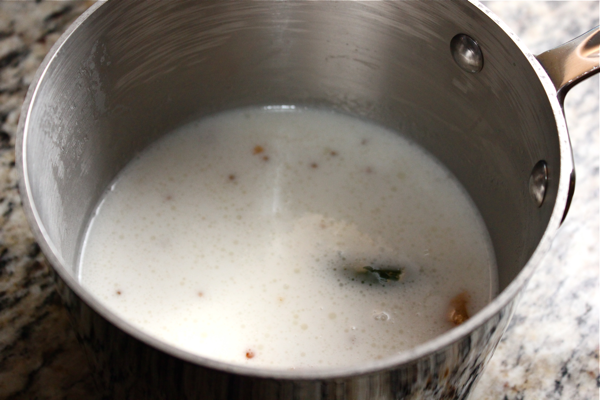 After that time, the rice should be fully cooked and all of the coconut milk should be absorbed. Pick the chili, ginger slices, and cinnamon stick out of the rice and stir it well to distribute the flavors. Garnish the rice with fresh cilanatro and some toasted coconut chips for extra texture. 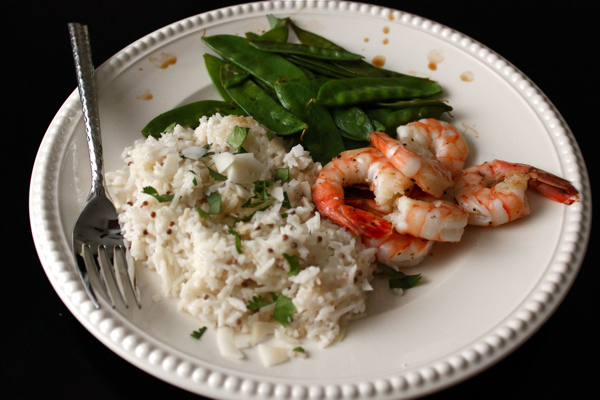 This coconut rice made the perfect side dish to ginger shrimp and snow peas steamed in soy sauce. I really hope you love this recipe as much as I do! This looks really great! Printing now! I’m new to coconut rice myself and have been experimenting with varieties in my pressure cooker. 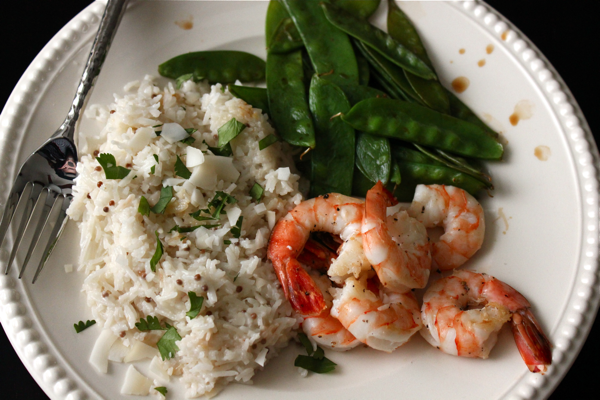 The last time, I added some drained kaffir lime leaves and used ruby red rice, it was yummy! I’m going to try your oven recipe. I really want to try cooking green and black rice- red sounds great too. The textures are so satisfying. This coconut rice is basically a glorified rice pilaf. I LOVE the TJ’s coconut chips!! Definitely trying this recipe.